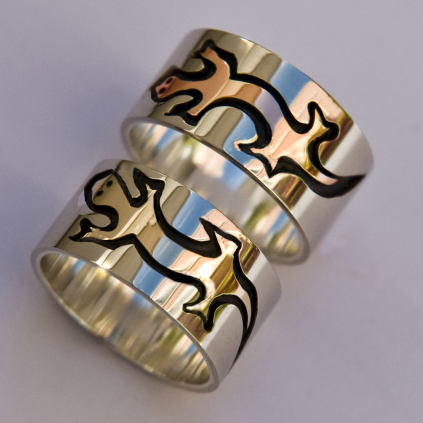 SCROLL DOWN to read about the symbolism of these clan rings. The Fisher is a forest-dwelling, weasel-like animal related to but larger than the American marten; its range covers much of the boreal forest in Canada to the northern fringes of the United States. Historically, the Marten and Fisher clans of the Anishinaabe Peoples have a common origin and share segments of a common culture. Among some Ojibwe communities, the Waabizheshi doodem (Marten clan) consists partly of descendants of the Maanadwe doodem (Fisher clan) of the Odagaamii Meshkwahkihaki, a sibling Anishinaabe Nation that once lived along the south shore of Gichigami (Lake Superior) in what is now Wisconsin and who were defeated in a fierce battle with the Ojibweg; throughout time, the Ojibwe Marten clan would also adopt many persons with a non-Native father and an Ojibwe mother. Fishers, or Ojiig(w)ag in the Ojibwe language, were known by the Anishinaabe Peoples as lively hunters and also for their fierce nature. Waabojiig, the White Fisher was especially loved by the Ojibweg. They stand particularly for singleness of purpose, and good sense. Several great War Chiefs of the Ojibweg who lived in the 18th and 19th century were named after Waabojiig, the White Fisher. Ojiiganang, a beloved constellation of seven bright stars in the northern skies, called Big and Little Dipper by the Euro-Americans, was also named after the Fisher. From of old, Marten clan members are in charge of labor and sustenance as they have always been the hunters and food gatherers of the Anishinaabe Peoples. But sometimes Marten clan members are also looked upon as ogichidaag (warriors)! In the communities of the Odaawaag of Michigan and southern Ontario as well as those of the Ojibweg of Michigan's Upper Peninsula – among whose forebears were the Baawitigowininiwag, People of the Rapids -, Waabizheshi doodem members are warrior clan people inclined to be great strategic logistic thinkers and defenders of Mino- bimaadiziwin, the Good Way of the Heart (Midewiwin) and of Anishinaabemowin, the beautiful language of the Anishinaabe Peoples. Their clan colors are yellow, light brown, and gold. They are considered Ogichidaag; warrior-leaders, not followers. Like their colors suggest, waabizheshiwag (marten people) go into the unknown and complete darkness without fear. They are known for their single-mindedness in the pursuit of their convictions and goals. In the old days, members of the Marten clan were master strategists in planning the defense of their communities, and they often served as oshkaabewisag (pipe bearers) and mizhinaweg (messengers) for the ogimaag (chiefs). Marten is known as an outsider who stands outside of the circle of those warriors who appeal to the imagination and attract the most attention: the bear, the wolf, and the lynx. Marten is on the outside looking in. Certainly the other clans are seen as protector, but it is waabizheshi who fights for change, for what is right, who makes change with an amazing intellect and strategic mind. He or she defends those who commit themselves to the cultural and educative values and the environment, to a proper use of the land and its recources, and to the survival of the language, science, and art of the Anishinaabe People.